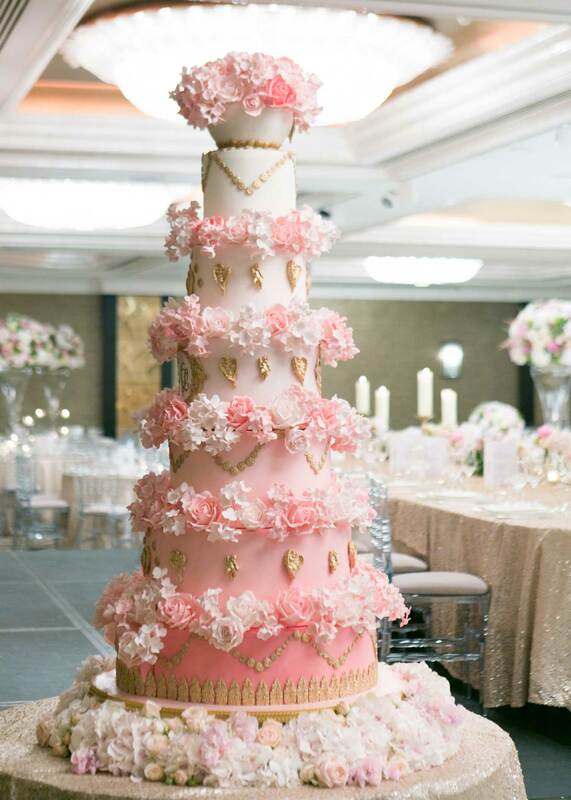 When beautiful Lebanese bride Lina made contact with us, she had a firm idea of the kind of wedding cake she wanted. 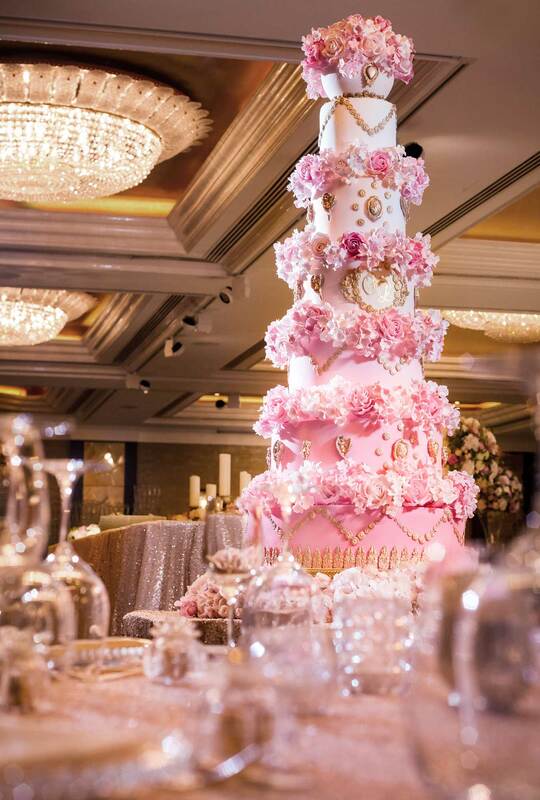 Having fallen in love with our purple ombre baroque Marie Antoinette wedding cake, she envisioned the design taking centre stage at her wedding reception at The Jumeirah Carlton Hotel in Knightsbridge but in glorious shades of pink. From the moment we met Lina and her lovely sister, we were struck by how beautiful she was inside and out! Very unassuming, she had firm ideas about what she wanted her cake to look like – huge but tastefully so. 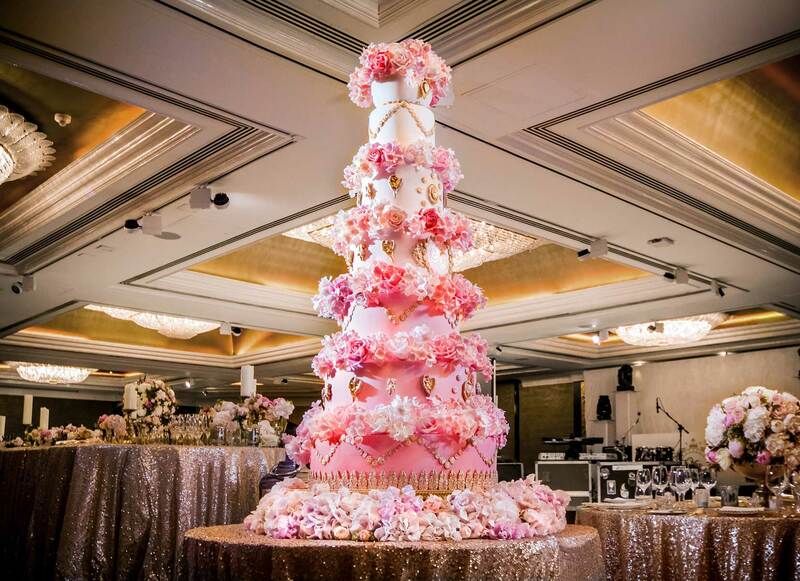 She wanted it to be a focal point of the reception because traditionally, Lebanese weddings tend to feature the biggest and most lavish wedding cakes. The cake had a 26 inch bottom tier and was made up of 6 tiers in total each 10 inches deep and was topped with a handcrafted sugar pedestal topper. 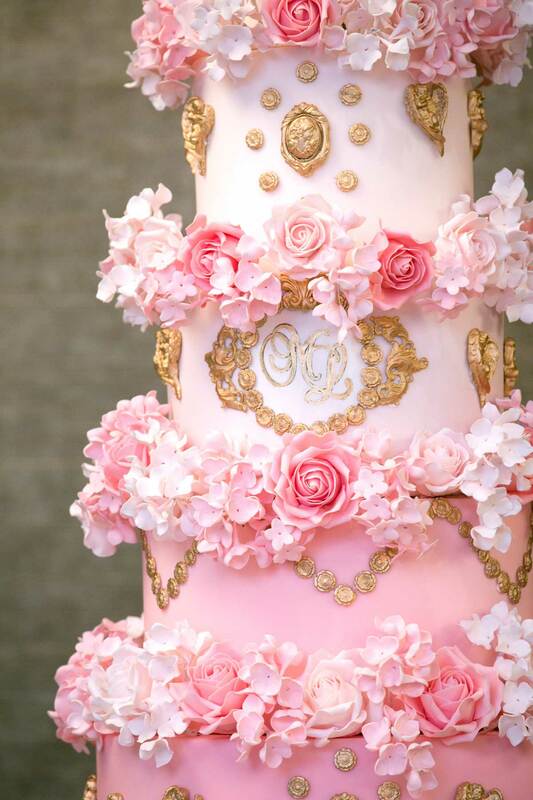 The tiers were decorated with lavish sugar gold coin swags, acanthus leaves, cherubs, cameos and different shades of pink sugar roses, hydrangeas, blossoms, berries, stephanotis and assorted filler flowers. 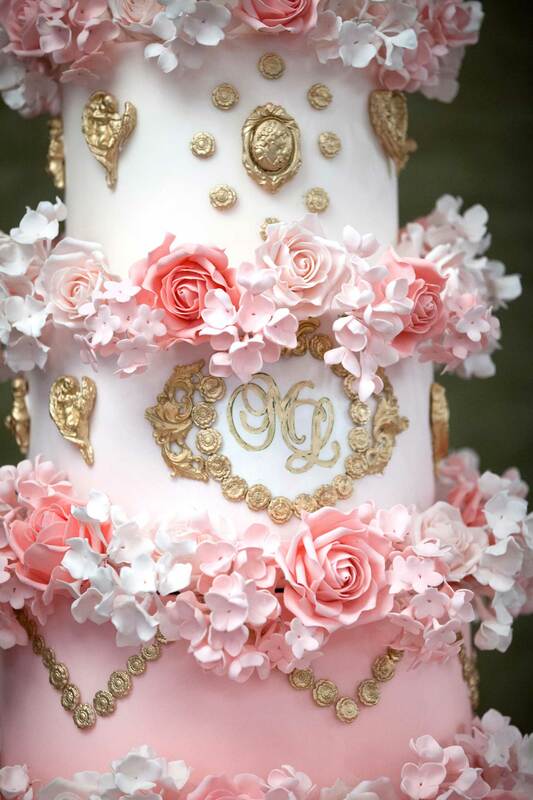 Renowned London award winning florist Amie Bone flowers provided the ring of pink blooms that surrounded the cake. 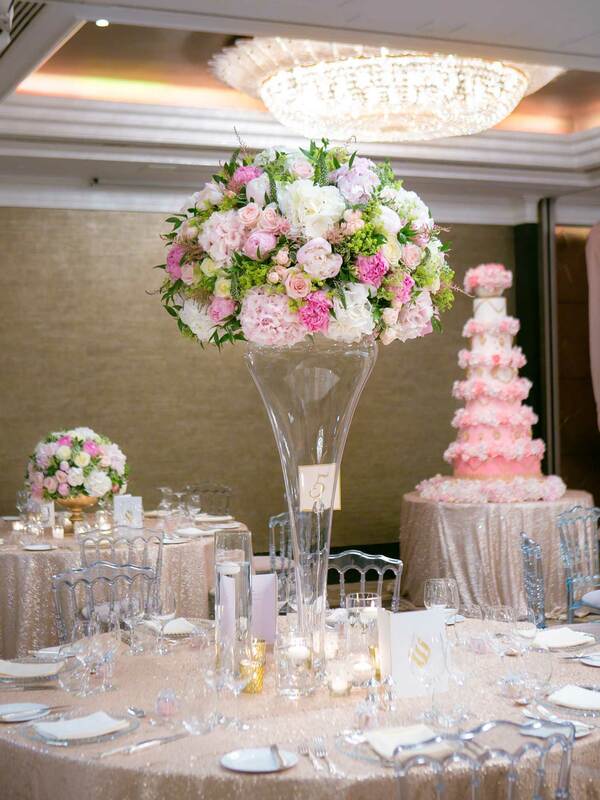 She also designed the beautiful wedding flowers, transforming the ballroom of the Jumeirah Carlton Hotel into a pink floral wonderland. The chosen cake flavours included our famous Triple Chocolate (her husband’s favourite), Red Velvet, Vanilla, Lemon and a selection of gluten free cupcakes which she thoughtfully ordered for some of her guests. The cake drew lots of admirers, including the Events Director who confessed that having previously worked in some of the best hotels around the world, she had never seen a cake that detailed! We wish Lina and her Prince Charming the very best of blessings as they embark on their new journey together.